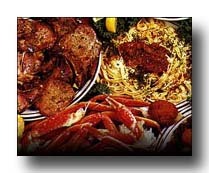 4930 South Kings Hwy,North Myrtle Beach 843-361-0000. That's two thousand … and counting! That's how many restaurants you have from which to choose in the Myrtle Beach Area. From elegant 5-Star experiences to the famous Calabash Seafood Buffets to Low Country eateries, few places in all the world offer a bigger or better selection of restaurants. To make things easier for you, we have divided the vast Grand Strand into three distinct sections - North Strand, Central Strand and South Strand. In the column to the left, we have recommended 4 restaurants in each section, all of which have been visited recently by carolinagolftravelguide.com raters and rank as favorites. We have also featured one restaurant from each section in the following narrative that we think you will really enjoy on your trip to Myrtle Beach. The great golfing champion from Down Under offers an innovative cuisine and a spectacular decor that makes you feel like you're in Sydney's finest harborside restaurant. Each wonderful dish is a symphony of flavors and a tribute to artistic presentation. Chef prepared entrees execute exotic Australian fare with a touch of finesse. Dinner includes fresh wood-grilled seafood, steaks, chicken, rack of lamb and much more combined with world class flavor, ambiance and presentation that will exceed all that you would expect in a great dining experience. One of our many favorites here is the Lobster Crusted Swordfish, with herbed barley risotto, fresh asparagus and roasted red pepper coulis. 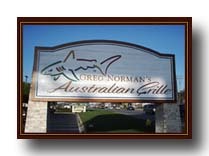 Impeccable service and overall menu knowledge of the staff will be sure to impress. 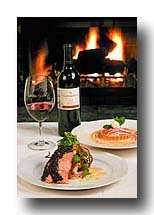 Their extensive wine list was given an award of excellence from Wine Spectator Magazine. Ask any local about the best dining experience around, and they’ll tell you, Thoroughbreds Restaurant is the cream of a very large crop of restaurants in the Mrytle Beach Grand area. There simply is no other dining establishment that provides its guests with the same level of all-around excellence. Thoroughbreds opened in 1988 and has proven year after year that it is truly deserving of all the praise it receives from its patrons. A team of culinary professionals with degrees from various well-regarded institutions prepare fresh seafood, veal, lamb, duck, chicken, and Certified Angus Beef that keeps people coming back year after year. Featured in Gourmet, Bon Appetite, Southern Living and National Restaurant Magazine, Frank's has set the standard to which other restaurants aspire. In the dining room, candles spill light on crisp white linens and professional waiters are trained to indulge their patrons without intruding. Shades of black and taupe lend softness to dark moldings and hardwood floors covered with oriental rugs. Frank's also has an enormous, antique mahogany bar - handcrafted in the late 1800's - and is indisputably favored among the locals. The Myrtle Beach Sun News reported, "Frank's is a comfortable, relaxing place to spend an evening." Frank's Outback has 45 seats inside the building and interestingly, the patrons get to walk through the open kitchen to enter the dining room. Once inside, you sense a warm welcoming atmosphere. The walls are painted in a rich chocolate with original artwork on the walls. White tablecloths, candle light, hand polished silverware and glassware grace the tables. There are also 100 seats outside, set in a garden setting under a canopy of trees. The outdoor seats are covered and not affected by weather. In the Fall and Winter guests are warmed by infrared heaters and the large outdoor fireplace.